The Totango team is excited to announce the release of the Customer Health Dashboard which helps cloud application providers and software as a service companies of all kinds track and manage overall user happiness at a glance (Read Press Release). The first of its kind, the Customer Health Dashboard is a configurable cloud-based tool that summarizes customer success and engagement using their realtime activity streams, capturing and calculating data like overall time spent, license use, CRM system feeds, and trouble tickets. With it, you can get a clear picture of your customer base’s health, identify customers at risk, and track trends across segments. The Customer Health Dashboard is especially useful to businesses who see value in the growing trend of shifting focus from acquiring new customers to driving usage, adoption, and happiness in existing ones — the hallmarks of customer success. For providers of software as a service, company revenue depends on having happy customers who keep renewing their subscriptions; the lifetime value of existing customers may end up far exceeding the gains made by simply picking up new ones. Customer success begins with customer acquisition and onboarding, but continues after a customer signs up with you; renewals and expansion sales depend critically on customer happiness. Totango found in recent customer success research amongst over one million prospects and customers of software businesses that over 50% of paying customers aren’t using the service they paid for. The same study also found an unsurprisingly near-perfect correlation between non-use and cancelations: cancelations of software subscriptions were almost always preceded by a period of non-use. 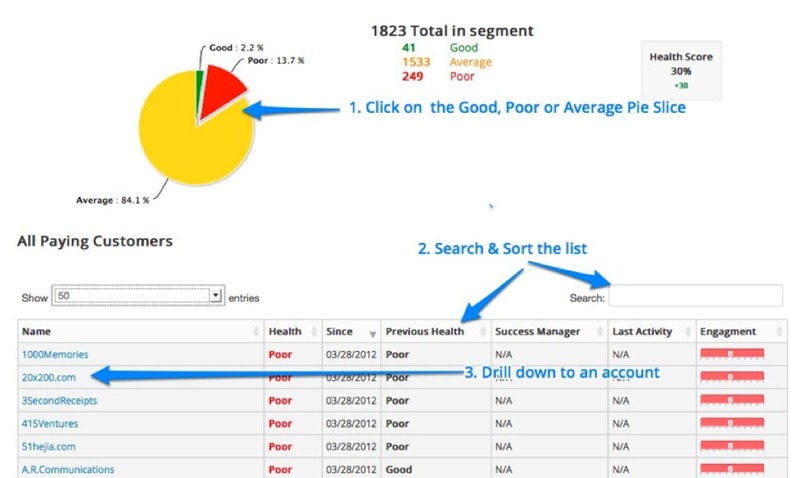 The Customer Health Dashboard can show you at a glance how well your success strategies are working and gives customer-facing personnel the tools to help customers be more successful where needed. Not only can you quickly locate your best customers, but you can also identify the ones requiring the most attention and take immediate action, engaging with them before they see a problem. Interested in learning more about customer success management (CSM)? Totango would be delighted to host you at our free meetup on The Future of Customer Success on Thursday, April 5th, from 7-8:30pm in San Mateo, CA. Mikael Blaisdell, publisher of The HotLine Magazine, will be on hand to give a talk and host a Q&A. Come have a snack, meet your fellow CSM professionals, and stick around for some customer engagement tips from yours truly.